Venice, CA - October 16, 2013 - Arbor Snowboards is proud to announce that they have hired from within bringing team rider, Sean Black up through the ranks to the position of Marketing Coordinator for the brand. Prior to accepting this new position, Black spent seven years building his career as a professional snowboarder in Salt Lake City, Utah which included the last three years on the Arbor Snowboards pro team. 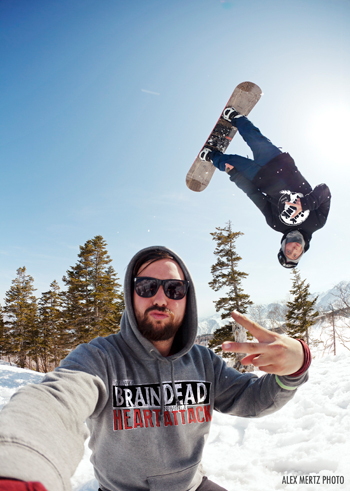 While Black was working on full parts in three consecutive Think Thank snowboard movies, he was also earning a bachelor’s degree in Strategic Communications from the University of Utah. In addition to his career as a professional snowboarder, Black has engaged with the snowboard community as a coach, judge, announcer, writer, and overall personality. Black will draw upon his insight into the snowboarding community as he takes on a principal role in helping with the coordination and implementation of Arbor Snowboard’s marketing initiatives including media outreach and team management. An expanding cooperative of athletes, designers, artists and friends, whose shared mission is bringing together forward thinking design, progressive technology and thought provoking art with the most sustainable production solutions available. For those of us who snowboard, skate, surf or simply thrive on getting outside, protecting the planet is about the environments we use everyday. To that end, the Arbor Collective continues building on an 18-year legacy of supporting the experience with the most environmentally responsible, next-level product possible.